The first thing we did was to send some people of our unit on foot to look for the 3months old calf of this cow, and an other young cow of 2 years old that had been shot in her back leg. The baby one was darted from a 4×4 and even with his young age and all the stress that he had been through, he was brave enough to tempt to charge the car. Once darted, our Protrack team help to move the little scared animal in the trailer with ropes and low electrical shock. This calf has been then safely transported to the rehabilitation centre of Moholoholo, where they will give him the best care (such a small baby will need to drink special milk every 3 hours). The young cow has been darted from an helicopter, it was a bigger mission to move this animal because of its size, and her mum staying around for a while. But everything went well, and the rhino has been treated. On the path to see the big cow poached, we observed 30 meters from her dead body drops of blood. It seems like she must have been running injured for quite a distance and some branches were broken. We also found around 15 meters from her body food and bottles of water. The poachers were staying in the reserve and knew that the animal was in this area. The big cow was found on her back. The bush around her body was completely trampled and broken, she must have been completely exhausted, and tried to face her attackers. The rhino carcass was relatively fresh, approximately one day old and started to be eaten by hyenas. With the help of the department of environmental affairs, we found with a metal detector 2 bullets in the rhino’s body: one in the left jaw and one in the front left leg. 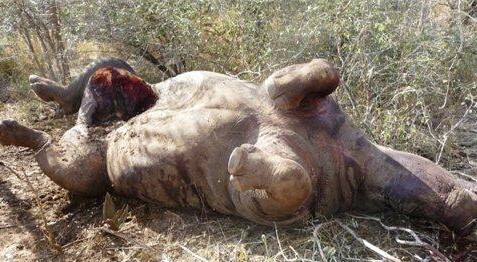 Those people from the department of environmental affairs took some samples of nails, tail hairs and ear skin to analyse the DNA of the rhino poached and identify it. From this DNA bank, if someone is arrested in the possession of a horn, we might then be able to identify the rhino that it has been taken from.